You are part of an incredible community. You empower an amazing organization. Donors, volunteers, staff and friends, we’ve never met. But I’m already impressed with you, because you’ve shown great judgment in supporting such a worthy cause. And are clearly generous, because I watched your support fly by the $25,000 goal that Deb and JoRelle set for your very first Giving Hearts Day campaign yesterday. African Soul, American Heart finished with $31,108, a total that will do enormous good in the lives of the young women that ASAH serves. My name is Alicia Underlee Nelson, and I had the privilege of watching how the ASAH Giving Hearts Day fundraising campaign unfolded as a co-planner, collaborator and volunteer. I’m a member of the Board of Directors for the New American Consortium for Wellness and Empowerment in Fargo. We provide English language tutoring, mentoring and job training programs for New Americans in the Fargo-Moorhead area. We also offer leadership training for refugee women and assist New Americans as they navigate this country’s complex medical and government systems. Since our goals of empowerment, wellness and strong community connections are so similar to ASAH’s “Protect, Education, Empower” mission, Kevin Brooks (who serves on the Board of Directors for both organizations and has a knack for spotting connections) suggested we collaborate. Since it was the very first Giving Hearts Day campaign for both ASAH and The Consortium, we all agreed it made sense. With Deb doing vital work in the field in Uganda, I assumed JoRelle (who has been a good friend of mine since high school) could use an extra set of hands as she put ASAH’s ambitious fundraising plan in place for this one-day event. Boy, was I ever wrong! The ASAH staff had it covered. We had a lot of fun integrating our two marketing and social media campaigns and finding ways to share the workload in order to use our time, funds and energy more efficiently. It was a fruitful and productive partnership for both organizations. I’m writing these words to you today because they are all still working tirelessly, sorting through the endless paperwork and spreadsheets that fundraising efforts like this requires. Since so much of this vital work goes on behind the scenes, out of view, it was great to be able to go to Red River Coffee in south Fargo yesterday and actually celebrate Giving Hearts Day with some of the people that make it happen. I joined JoRelle and Darci Asche, Volunteer Director of Development for The Consortium, as they set up their laptops, fielded calls, answered emails and cheered for the generous donations that we received. The coffee shop became a shared second office, one where we chatted with friends (including, perhaps, some of you), greeted board members and handed out candy to curious customers, some of whom spontaneously donated on the spot. It was wonderful to connect with our community in this way. 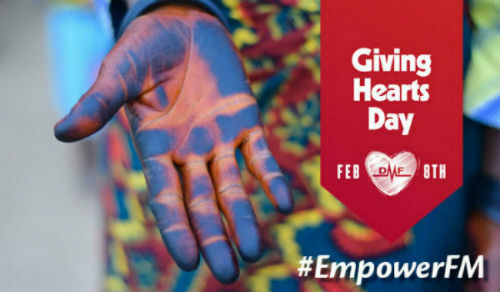 Collaborating on Giving Hearts Day helped both organizations share our stories and our missions in new ways. We were able to examine our messages with fresh eyes and it made both fundraising efforts stronger. And it certainly helped us share the workload, which really mattered during those thrilling hours when we all watched the donation totals climb and climb. Yesterday, our community rallied and earned over 13 million dollars for worthy causes in just one day. That total makes me grin and absolutely blows my mind. If you were one of the 28,043 souls that gave yesterday, we thank you from the bottom of our hearts. You are a part of that incredible display of generosity. It was amazing, beautiful, incredibly productive day that should fill us all with hope and pride. But Giving Hearts Day is just the start. Now we get to watch and see how the funds raised in just a few hours will help ASAH continue to provide real and lasting change for our girls. I love that ASAH donors, friends, staff members, board members and volunteers call the young women of St. Noa Boarding School “our girls.” I started saying it too. That’s because they -- just like the neighbors my organization empowers -- are much more than a cause. They are distinct individuals, with talents and passions. They are part of our community, even though most of us have never met. I saw the social media update that told me that Mary Aluel wants to be a pastor and I nodded as I sipped my coffee. She’s a leader already, a capable head girl, so that makes perfect sense. I hope Sarah Akoul accomplishes her dream of becoming a journalist. I’d love to welcome her as a colleague and collaborate with her in the future. I got a little emotional when I learned that Deborah Yar, who wants to be a doctor, received a microscope. It was more than just a tool. It was a confirmation that this community believes in her so much that it’s willing to invest in her. Thank you for believing in her. Thank you for investing in your community, both at home and abroad. Thank you for reminding us all that we can accomplish incredible things when we work together. Alicia Underlee Nelson is a freelance writer and photographer who loves tracking down uniquely local stories and immersive, off the beaten path travel experiences in the Midwest, the prairie provinces of Canada and around the world. She is based in West Fargo, North Dakota, but will follow a story wherever it takes me. Visit her blog Prairie Style File to read more of her amazing stories!